With CVS recently announcing that it will begin to permanently phase out photoshopped images from their beauty aisles, it's difficult to deny that a major shift toward authenticity in the beauty industry has begun. The glossy ads that portray images of contoured, poreless and almost plastic-like skin textures have seen their best days. By 2020, all beauty brands sold in CVS's 9,600-plus stores nationwide will require an alert label placed on an image that contains photo manipulation. We are about to see beauty packaging and imaging for major cosmetic, skin care and personal care products in a whole new, unapologetically raw light. CVS President Helena Foulkes has said that "unrealistic body images" are a "significant driver of health issues especially among women." 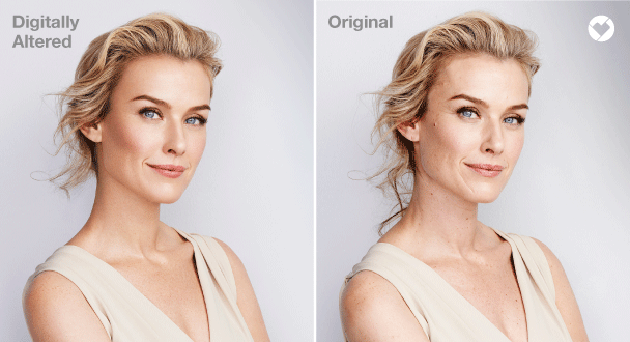 Which begs the question: Are photoshopped beauty images the new GMO? As a skin care and wellness practitioner, I can say an emphatic yes to that! Take a look at the the food industry. It has been going through its own revolution with companies like Whole Foods creating standards for the types of foods and ingredients that line their shelves. Food labeling has changed from the basic food pyramid to labels including warnings about gluten, transfats, added sugar and GMOs. Many people now prefer their local farm co-ops to major grocery store chains and are avoiding fast food more and more. It's no surprise that if the public is demanding information about food, then products used on the skin and body would be next to be heavily scrutinized. We can see the massive rise of the indie beauty and wellness movement that is now dominating a huge portion of the beauty industry. We recently saw grassroots brands like Native and Schmidt's natural deodorant companies being bought out by Unilever and Proctor and Gamble, respectively, for millions of dollars. Furthermore, companies like Johnson and Johnson, Maybeline and CoverGirl are surely taking notes from companies like Glossier and Drunk Elephant, which are selling out faster than they can be manufactured. They are so on trend that they struggle to keep inventory available online and in Sephora. Glossier had a 600 percent year-over-year growth from 2015 to 2016 and growing, according to Inc.com. Glossier delivers skin care and beauty products that give a beautiful, sheer, dewy look and celebrate imperfections on the skin. They run ads with athletic and plus-size models and try to be as inclusive as possible. They now have an enviable cult following. Drunk Elephant, a nontoxic, clinical-strength skin care line that prides itself on ingredient transparency has raked in more than $25 million for its founder, according to Forbes. All in all, the trends point to a beauty industry that favors transparency in ingredients, sustainable environmental practices, embracing flaws and inclusiveness. So why is the quest for physical perfection and flawlessness out? Why is the term "anti-aging" verboten? Ask the millennials. Smart companies are looking more and more to the preferences and buying habits of the teens and young adults worldwide to see what they have to say. Millennials expect a lot from beauty brands they support: fair pricing, multiuse applications, transparency in manufacturing, a sense of social responsibility, cruelty-free practices, vegan options and respect for individuality. Mike George, the CEO of QVC was reported in Forbes saying that there is a "collapse of institutional and brand authority" in the beauty industry, and there are four reasons why. He believes that millennials don't have much "trust in society," don't agree with the "race to the bottom" style of doing business that offers products at the lowest prices possible, and that they "crave authenticity" and have "shifting sources of influences" (i.e., social media, etc.). In short, millennials aren't just going to eat up whatever is served at the table. They have their own specific standards and are voting with their dollars by the millions. There is no denying that millennials are the current and future beauty consumers. Companies must make some significant changes to appeal to them or be left in the dust. With the focus on authenticity and transparency in product labeling, ingredients and the images that represent them, we will see photo-manipulated images fading into the background. Alerting consumers about photoshopped images will gain the support of current and future shoppers and become the new normal. 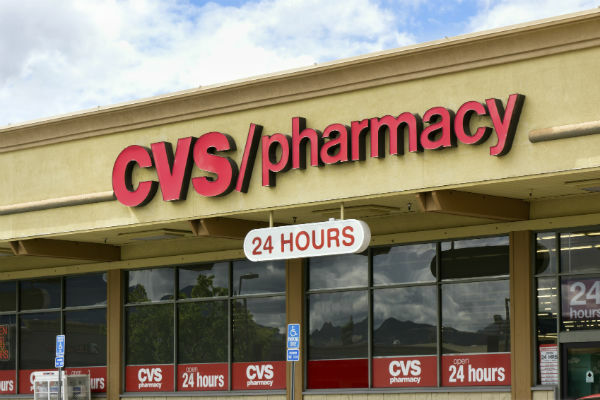 CVS is making a bold move but a smart one, in my view. The companies that are thriving right now are not afraid to bare it all — the good and the not so good. Smart shoppers want the opportunity to make their own decisions about beauty products and all of the images that represent them. The time is long past due for a transparent beauty industry, and we are only now seeing just the tip of the iceberg.